I love clothespins. They are versatile, they have many uses, and at the same time, they are great for exercising little fingers. To tempt you to use them more often with your group of children, here are 5 different ways they can be included in daily activities. Of course, do not hesitate to adapt these suggestions to make them your own. Draw a vertical line in the centre of your paper to divide it into two equal parts. On one side write "To do". On the other side, write "Done". 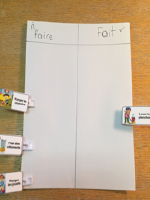 Laminate your task chart for durable, eco-friendly use. Print, laminate, and cut out the illustrated tasks. Glue one illustration on each clothespin. Arrange the clothespins corresponding to the tasks that need to be done on the "To do" side of your task chart. Show children how they can move the clothespins to the "Done" side as they complete the tasks. Glue a picture of a child on each clothespin. Each child will have his own clothespin. Determine the order in which children will get to participate in an activity or complete a routine by arranging the clothespins on a clothesline. You can, for example, use this tool at lunch time, for handwashing, to determine the order in which children get to choose a toy/game, etc. For each child, cut an 8.5 x 11 piece of construction paper in two. Draw 10 stars, 5 on each half. Each child must have his own piece of construction paper with his name on it. Cut out the five stars that are on the bottom section of each child's piece of paper. Glue each one on a clothespin. For each child, determine simple actions that you wish to reinforce (picking up toys, helping others, etc.). Every time a child does what it is you want him to work on, give him a clothespin to add to his chart. Once a child has 5 stars, reward him with a special pre-determined treat or surprise. 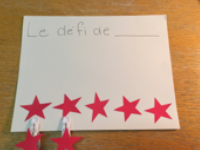 Note that the five stars on each child's piece of paper will help little ones understand how many more stars they need to earn to get a reward. Paint one clothespin with each color of poster paint. Let dry. Hang a rope within your daycare, where children can see it (30 cm of rope is ideal). Arrange your painted clothespins on the rope in order (green, yellow, red). Use this light system when you give children instructions. The 1-2-3 method is great for giving warnings and applying logical consequences when instructions or requests are not respected or bad behavior is present. When you give a child his first warning, remove the green clothespin. Remove the yellow clothespin after giving a child his second warning. If a third warning is necessary, remove the red clothespin and apply a logical consequence. Print and laminate the illustrations representing your different routines. Hang the rope on a wall where children can see it, but not reach it. Arrange the clothespins on the rope to represent the order in which routines will be executed during the day. Follow your illustrated schedule throughout the day. Every time a routine is completed, remove the corresponding illustration and move on to the next one.